↑ Covil, Eric C. "Radio and its Impact on the Sports World". American Sportscasters Online. Retrieved May 6, 2007. ↑ "MILLER IGNORES O'BRIEN. : Says His Attitude on Transit Plans Is "Sufficiently Illuminating."". New York Times. October 4, 1921. p. 3. ↑ "SERIES ATTRACTING MANY VISITORS HERE: Hotels Report Lively Demand for Rooms During World's Baseball Classic. Fans Come Without Tickets. Would Be Near Babe.". New York Times. October 4, 1921. p. 20. ↑ "FOURTH FOR JENNINGS. : McGraw's Aid Has Figured, With Tigers, in Three Previous Series.". New York Times. October 4, 1921. p. 20. ↑ "LUCK FAVORS SOME; FROWNS ON OTHERS: Some Players on Both Teams Fall Heir to Unexpected Series Wealth.". New York Times. October 4, 1921. p. 20. 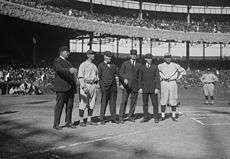 ↑ "1921 World Series Game 1 – New York Yankees vs. New York Giants". Retrosheet. Retrieved September 13, 2009. 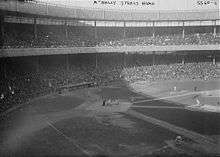 ↑ "1921 World Series Game 2 – New York Giants vs. New York Yankees". Retrosheet. Retrieved September 13, 2009. 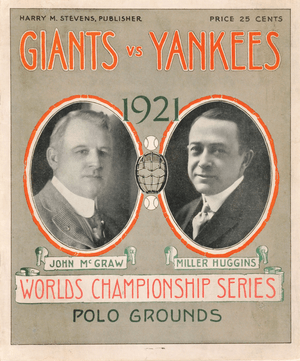 ↑ "1921 World Series Game 3 – New York Yankees vs. New York Giants". Retrosheet. Retrieved September 13, 2009. ↑ "1921 World Series Game 4 – New York Giants vs. New York Yankees". Retrosheet. Retrieved September 13, 2009. ↑ "1921 World Series Game 5 – New York Yankees vs. New York Giants". Retrosheet. Retrieved September 13, 2009. ↑ "1921 World Series Game 6 – New York Giants vs. New York Yankees". Retrosheet. Retrieved September 13, 2009. ↑ "1921 World Series Game 7 – New York Yankees vs. New York Giants". Retrosheet. Retrieved September 13, 2009. ↑ "1921 World Series Game 8 – New York Giants vs. New York Yankees". Retrosheet. Retrieved September 13, 2009.